Heaven - a Pit in your lap and a beer on the side! Here's Bruno our rescued Pit from being abandoned on a cold, country road years ago. From the very beginning he figured he was a lap dog and so who are we to tell him otherwise. My partner holds him likes he's a baby. A beer and a Pit, who can ask for more. Good stuff right there. That doggy is a lover, not a fighter. He is a lover. He'd rather get love than food and so does his lady companion Brandy. They compete for the most pets. Hard to satisfy that type of addiction, but we do our best. 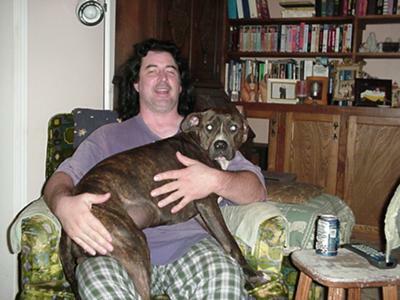 Mt pit has ALWAYS ben a lap dog. I rescued him at 3 months old from a kill shelter and he is now going on 4 years old. Peanut is well over 80 lbs. I think and his weight never bothers me. I LOVE to cuddle with him. This breed is the BEST anyone could be privileged to share their life with. That is too cute! My pit is the same way. He always has to be in someones lap. Lol. I have 2 pits both 65 n up stay on my lap or on my back.I love they are my babies and they know! My female like to sit in my sons car seat when she gets in the car. They r to much but I love them!